My journey into coaching evolved out of my life-long interest in personal growth, spirituality and my desire to work with people. I completed my undergraduate work at the University of San Diego with a major in Psychology and a minor in Philosophy. I went on to receive my Juris Doctorate degree from California Western School of Law in San Diego, California. After practicing law as a successful litigator for more than six years, I have returned to what brings me the most joy in my life, working with others to teach them the necessary tools to live an extraordinary life. The most exciting part about life for me is discovering who I am and what bring me the most joy. Marcus Buckingham, a powerful motivational speaker, defines “a strength” as “something that makes you feel strong.” In my work with my clients, we work together to identify your true strengths and passions. My coaching utilizes the coaching techniques developed by Martha Beck, best-selling author of “Finding Your Own North Star”, “The Joy Diet”, “The Four Day Win” and columnist for O: Oprah’s Magazine. My coaching also draws upon Byron Katie’s work with a four-question inquiry, which increases personal awareness; and Marcus Buckingham’s “Simply Strengths” work. I live in sunny San Diego, but since most coaching is done over the telephone or through e-mail, I work with clients all around the continent. 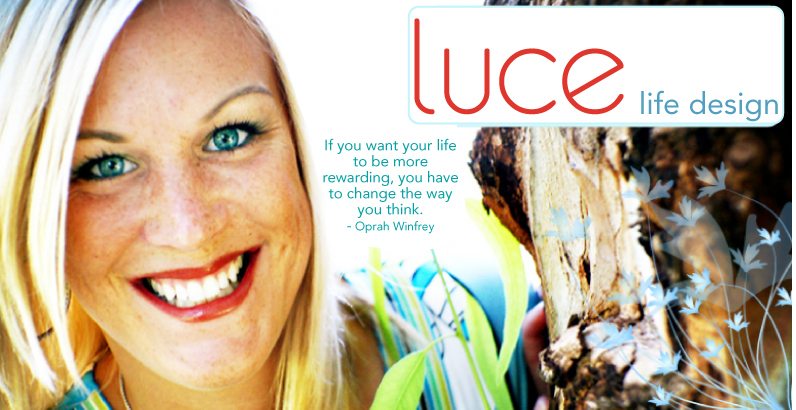 Luce Life Design is named after my very first life coach, Judith Perkins Gordon (“Aunt Judie”) – June 1944-July 2004. Luce (pronounced “lOO-chay”) means “Eternal Light”. Aunt Judie was and still is my strongest teacher of how to live my right life by following my inner "light", my true north star. She was a perfect example of someone who followed her inner light, and always encouraged me to do the same. Despite much adversity in her life she sought out joy, and as a result she was very successful in her business, “Luce”, which imported Italian lighting to famous restaurants and stores throughout the United States.